Dialogical Self Theory recognizes the interaction between self and others. The basic nature of human condition is indeed to be in indefinite and constant interdependence with the existence of “the other” and his experiences, thoughts, practices as well as his narrations. Yet, the character and degree of these interdependencies vary and fluctuate depending on the individuals, contexts and cultures. 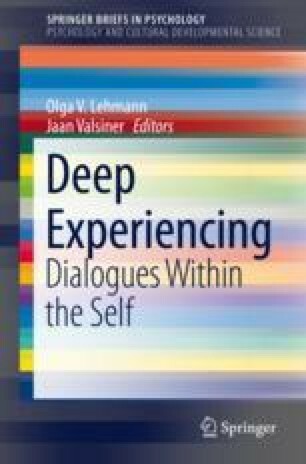 While the external dialogue occurs between people implicated in an overt interaction, the self happens in an individual’s mind as an internal dialogue. Individuals make sense of their lives through the narratives of crucial experiences in their lives, which makes the external dialogue discernible and easier to analyse compared to the internal dialogue not that easily tangible. Though, through an intergenerational interview between an adult daughter and her mother, we will try to assess and identify their individual internal dialogues within their narratives. Hence, to that end body language and behavioural indicators such as face expressions or silent thinking will be used, which may help and serve as guidelines to assess the intergenerational dialogical interaction between mother and adult child in a migrant context. Albert, I., & Barros, S. (2017). Family culture in the context of migration and ageing. Integrative Psychological and Behavioral Science, 1–18. https://doi.org/10.1007/s12124-017-9381-y. Statec (2015). Le Luxembourg en Chiffres. Retrieved from http://www.statistiques.public.lu/catalogue-publications/luxembourg-en-chiffres/luxembourg-chiffres.pdf.